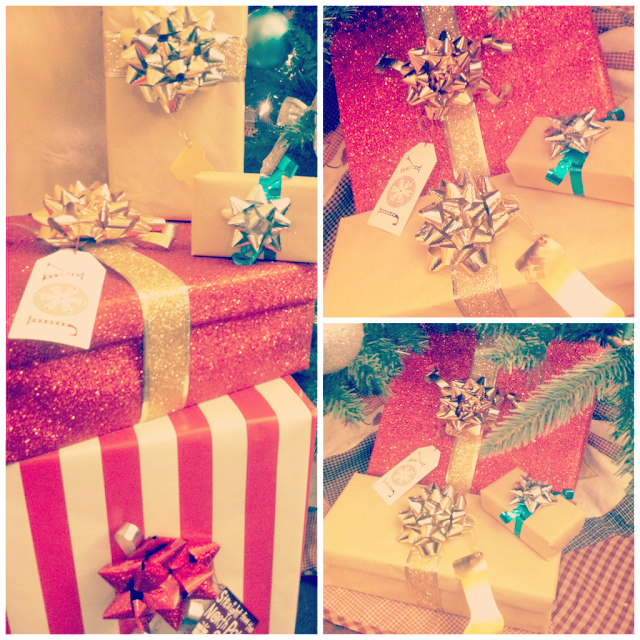 Wifestyles Blog & Photography: Gift Wrapping! One of my ALL time favorite things about Christmas is gift giving! I love the entire experience! From wrapping, to seeing them rip your creation to shreds! With that being said... it's safe to say that I spend HOURS of my time before Christmas perfecting my Christmas presents! I absolutely love to make others gifts look extra special! I seriously go on hunts for "perfect" paper! This year I found some glittered paper and I'm beyond in love! One of my most favorite papers to wrap with is craft paper! The possibilities with craft paper are endless! Have you guys finished your Christmas shopping yet?! And do you guys love to wrap just as much as me? You have some serious skills! I think I need some pointers. Gift giving is my favorite too! Perfect for gift giving, and parties. I am absolutely in love with your glitter paper! Can you please come over and wrap mine!? These are beautiful girl! Your presents look SO PRETTY!!! I loooooove wrapping!! If I had tons of $ I would make my gifts look so perty, I love to see pretty gifts under the tree knowing that other people are going to get to rip them open! Random question - how do you buy gifts without your hubby seeing the purchases on the credit/debit card statement? I've always wondered that haha. those are such beautiful packages, Lauren! I can't wait to wrap mine tonight!! It's hard to keep presents under the tree with kids around!! I LOOOOVEEEEE glitter!! I love love love wrapping too! In fact, I'm hoping to do some tonight! That glitter paper is AMAZING! Your wrapping is so pretty!! I love wrapping too, I always do it to Christmas music and really get in the spirit. It doesn't look as good as yours though! i love love these photos!!! That glitter wrapping paper is perfection! Girl, I love wrapping too! Each present is like a little piece of art... all the pieces have to go together. (: We're almost done with Christmas shopping... but not done with wrapping. I even made some paper this year with plain paper, doilies, and paint. I love your glitter paper though... it's so pretty! These are gorgeous! Love you blog, looking forward to reading more of it!